Tag "Batman, Teenage Mutant Ninja Turtles"
I’ve never been much of TMNT fan. I appreciated Eastman & Laird’s independent spirit when the Turtle’s first debuted, but I never watched the cartoon or the movies that followed. So I approached this series with a bit of hesitation. How will these pizza-obsessed mutations mesh with the Dark Knight? In the story, a depressed Donatello attempts to journey to DC’s Earth 1, but in so doing, he accidentally sends Bane to his own world. Bane wastes no time taking over the Turtle’s New York. He assumes control of the Foot, and immediately begins dosing them with his venom, the juice what gives him his steroid-level muscles. And that’s when the series becomes high-camp. Consequently, Batman becomes less the Dark Knight and more of a Caped Crusader. More and more, as I progressed through each issue, I stopped hearing Kevin Conroy’s voice and heard Adam West’s instead. 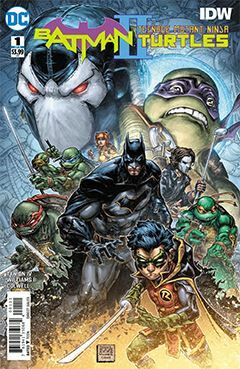 And then it began to work, because the story and art are so over-the-top camp, it’s the only way Batman and the Teenage Mutant Ninja Turtles could function as a team. Bane is rendered so overly muscularly, it’s akin to something out of a Looney Tunes cartoon. His dialogue is straight out of Warner Bros, a mix of the Humungus (the Ayatollah of rock ‘n roll-a!) and every cheesy serial villain of the 1930s. If that sounds like a cliché, best get over it. This series is chock full of them, from “teenagers only care about pizza and video games,” to “we have to fight each other before we team up” trope. Overall, the series is fun, if one is not too beholden to the whole “grim and gritty” Dark Knight persona. As for the Turtles, they’re still not my cup of tea, but I’ve read lesser team-ups.